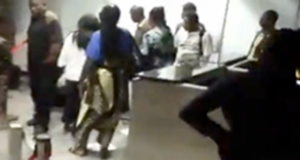 This past Wednesday, a big wahala happened at the departure section of Murtala Muhammed International Airport in Lagos following the delay some passengers experienced on a New York-bound Arik Air flight. The passengers were spotted protesting their delay after Arik Air refused to take off on time over aviation fuel scarcity problem. One of the passengers recorded the protest.